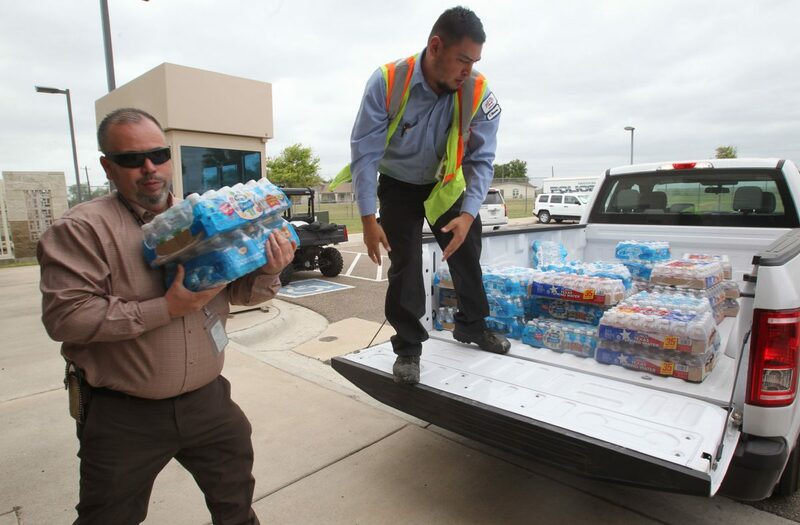 Arturo Madero, operations manager, and Robert Rincones, a maintenance employee for the city of McAllen, unload drinking water at the Anazalduas International Bridge on Friday March 23, 2018, in Mission. The water will be given out during "semana" santa Easter week for those crossing the bridge. McALLEN — In anticipation of voluminous holiday traffic for the upcoming Easter holiday, the Anzalduas and Hidalgo-Reynosa International Bridges are paying overtime hours to Customs and Border Protection officers. CBP has additional lanes open for the holiday this weekend, including Palm Sunday, and again on Thursday. The federal agency will have additional supervisors managing the extra lanes to expedite their processes, and the city will also be providing bottles of water to cars waiting in line. Anzalduas will have two traffic lanes open from 8 a.m. to 4 p.m. on Sunday and Thursday. The Hidalgo Bridge will have two additional lanes open from 8 a.m. to 4 p.m. on Sunday and Thursday as well. Toll booth collector David Castaneda hands out a free taco and coffee to one of the first 20 truck drivers that crossed Friday, March 23, 2018, at the Anzalduas International Bridge in Mission. 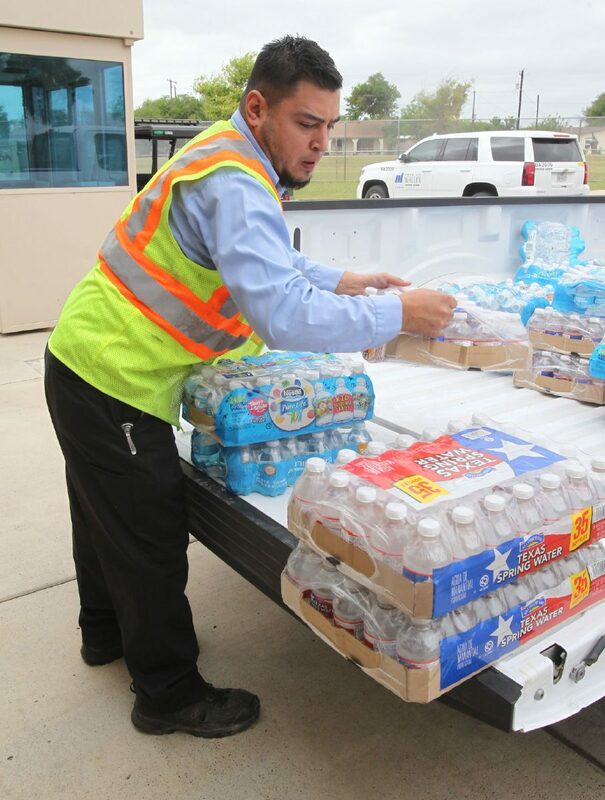 Robert Rincones, a maintenance employee for the city of McAllen, unloads drinking water at the Anazalduas International Bridge on Friday March 23, 2018, in Mission. The water will be given out during Semana Santa (Holy Week) for those crossing the bridge. The city is able to assist with events like this through CBP’s public-private partnership program. Increases in passenger and cargo volumes in 2014 outpaced CBP’s personnel and infrastructure resources, so the agency implemented this program to help with those needs. McAllen will pour $23,040 into overtime services for CBP, City Manager Roel “Roy” Rodriguez said. Superintendent of Bridges Rigo Villarreal said the bridge sees about 3,000 daily crossers with an average of 60 minutes. During holidays, traffic increases approximately 65 percent, Villarreal said, with about 5,000 daily crossers and wait times between two to three hours without additional overtime assistance. While the bridges are mostly concerned about passenger vehicles over holidays, the Anzalduas Bridge is continuing to push its truck traffic. The bridge began serving southbound empty trucks in August 2016. The first 20 southbound empty trucks receive free tacos and coffee.